Gather around, my thieving internet children, today we’ll be reading the rotten prosody of undying outlaws. It’s long been known that 30s crime-spree principessa Bonnie Parker composed poetry, a fact immortalized in the perfect 1967 film Bonnie and Clyde. She wrote, for instance, these famous lines: “You’ve read the story of ‘Jesse James’, / Of how he lived and died. 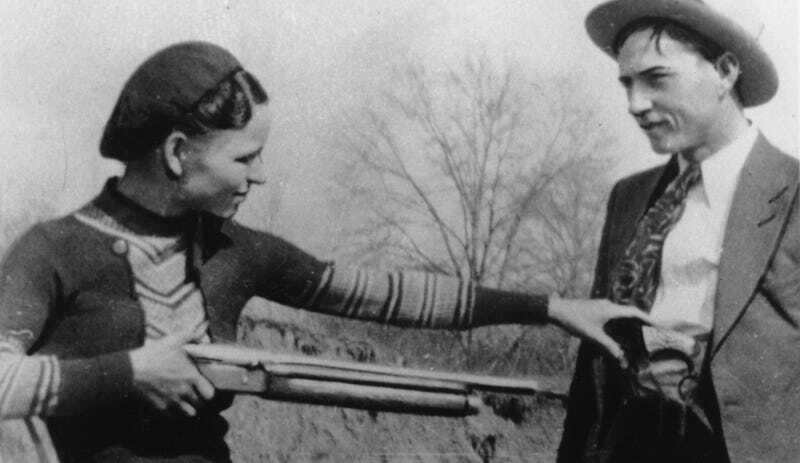 / If you’re still in need / Of something to read, / Here’s the story of ‘Bonnie and Clyde.’’ She and Clyde Barrow also went around the country robbing various establishments blind over a 21-month period that culminated in cops killing the pair in Louisiana in 1934. Though the auction house, Heritage Auctions, has not been able to fully authenticate the document, the notebook is going up on the block in April. “This poem and the subsequent one signed by Clyde are redolent of the jargon of ‘gangster-ese’ which Depression-era Americans were inculcated with through the media of films, radio and pulp fiction,” said the Dallas-based auction house. “Both poems are riddled with spelling errors that are characteristic of Clyde.” I can only hope the same is said someday of my blogs.